Decorate your beautiful neck and colorful life! The commission of this necklace is to create fashionable and elegant jewelry to add an irresistible sparkle to each girl or woman's everyday look. The sterling silver necklace is plated with rhodium, a precious metal to delay the oxidation of jewelry to the largest extent. It provides full protection to the necklace and minimizes scratches and tarnish. 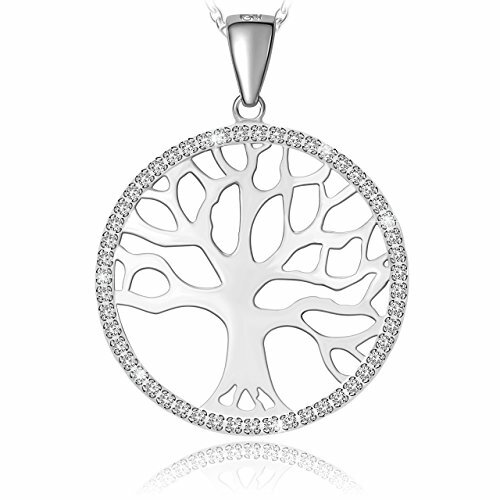 The white, reflective appearance of rhodium also adds brightness and beauty to the necklace. The necklace is 45cm(17.72in) long in total (including the 3cm extension chain), which meets the requirements for most women/girls. It can be used as an indispensible gift for birthday, Christmas, graduation, anniversary, Mother's Day, Valentine's Day, Thanksgiving Day, etc. Atmoko provides a 45 days money back and 18-month warranty.